Sure it’s called a laptop, but a lap is no place to put a hot computer for hours at a time. The Artecnica Laptop Case unfolds to become a portable workstation, or at least that’s the idea. 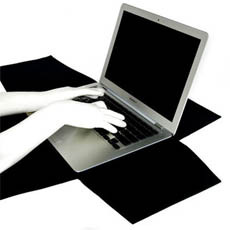 The neoprene lined case comes in 13″ and 15″ and keeps laptops safe from scratches. Still in concept phase, there are no details on how exactly it stays together or how much it will cost, but we can’t wait to have one to save our laptops from sticky coffee shop tables.